Minqi Li studied at Beijing University between 1987 and 1990, and participated in the 1989 student democratic movement. Between 1990 and 1992, he was a political prisoner. He came to the United States in 1994 and received his Ph.D. in economics from the University of Massachusetts Amherst in 2002. From 2003 to 2006, he taught political science at York University, Canada, and since July 2006, he has taught economics at the University of Utah. His current research interests include the long-term movement of the profit rate in the capitalist world-economy, the structural contradictions of neoliberalism and global financial imbalances, global environmental crisis, and the historical limit to capitalism. 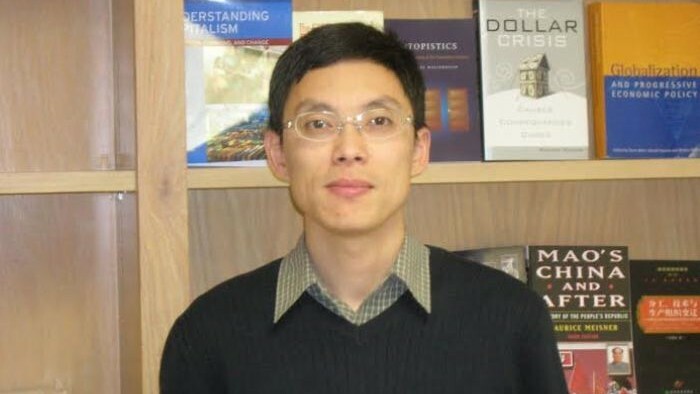 His recent books include The Rise of China and the Demise of the Capitalist World Economy (Pluto Press / Monthly Review Press, 2009) and Peak Oil, Climate Change, and the Limits to China’s Economic Growth (Routledge, 2014). His new book, China and the 21st Century Crisis, will be published by Pluto Press in 2015. This is an interesting question. It may not be exaggerating to say that since the late 20th century, there have been no major theoretical advances in either neoclassical economics or Marxian political economy, as the two fields are traditionally defined. However, in my own research, I have benefited substantially from the world system literature and the ecological limits to growth perspective. The most important question confronting all serious intellectual thinkers today has to do with how to understand our existing social system in the current historical conjuncture. Is the capitalist world system in a structural crisis? Can the various economic, social, geopolitical, and ecological contradictions be resolved within the system’s own framework? Or will the system have to be replaced by one or several new systems? I was a participant in the 1989 student democratic movement in China. The 1989 movement was a complicated historical event. Although it reflected to some degree the genuine desires for political and economic democracy on the part of the working class, the movement was clearly led by “liberal intellectuals” who were strongly anti-socialist and believed in free market capitalism uncritically. In fact, I was an economics student in Beijing University at the time and embraced the neoliberal economic model. My political views began to shift to the left as I realized that a genuine popular democratic movement could not succeed without the mobilization of the working class, and there was an obvious contradiction between a political program, which called on the working class to support democracy, and the neoliberal economic program, which demanded privatization and massive layoff of state sector workers. Since the turn of the century, the Chinese working class has been gradually radicalized, and a significant intellectual and social left has emerged in China. The overwhelming majority of the Chinese left today consider themselves as “Maoists” of one sort or another, reflecting the historical legacy of the Maoist revolution. In recent years, I have been actively involved in the Chinese leftist activities. Both crises of capitalism and claims that they are symptoms of its demise have come and gone over the decades. What makes the current conjuncture qualitatively different? An inexperienced doctor may provide a wrong diagnosis and prematurely announce that a patient is beyond treatment. But the recognition of the doctor’s mistake, even several times over, should not lead one to conclude that some human being can live forever. Capitalism is a social system. That means it has certain essential characteristics and follows certain laws of motion. For capitalism to operate with these essential characteristics and basic laws of motion, it depends on certain historical conditions. But underlying historical conditions tend to change in the long run. Within certain limits, capitalism may adapt to the changing underlying conditions. But beyond certain limits, the underlying conditions begin to diverge so much from the range that is compatible with the basic operations of the capitalist system that the system can no longer reproduce itself. Then a bifurcation will occur leading to the system’s demise. I think this is essentially the same as Immanuel Wallerstein’s argument that the capitalist world system is now in a “structural crisis” (by “structural crisis”, Wallerstein means the final, insoluble crisis). In particular, the defining feature of capitalism has to do with its capacity to accumulate capital on increasingly larger scales. This is what really distinguishes capitalism from all pre-existing social systems. An obvious limit to this tendency towards “endless accumulation” has to do with the ecological constraints. Of course, a technology optimist will argue that we can have both infinite economic growth and ecological sustainability. I think there are fundamental reasons why ecological sustainability cannot be achieved under the condition of endless economic growth, or at least with an economic growth rate high enough to sustain economic and social stability required for capitalism, no matter how you measure “economic growth”. In any case, it is beyond dispute that, despite all the talks about “sustainable development” or “green growth”, the world continues to head relentlessly towards global ecological catastrophes. We know this as we observe that the global ecological deficit (the gap between ecological footprint and bio-capacity) continue to widen and the atmospheric concentration of greenhouse gases keeps rising year after year. Capitalist accumulation has transformed the world’s social structures. Marx called this “proletarianization.” Of course, the proletariat has not yet become the “grave diggers” of capitalism. But the modern working class has greater organizational capacity and more advanced political consciousness, in comparison with the historical labouring classes. This has allowed the modern working class to demand a greater share of the capitalist economic output over time. The stronger working class power was the underlying cause of the major economic and political instabilities the capitalist world system suffered during the 1960s and the 1970s. Neoliberalism has been the attempt of the system’s ruling elites to reverse the long-term historical tendency towards the strengthening of the working class power. Neoliberalism has partially “succeeded” in re-establishing favourable conditions of global capital accumulation largely by mobilizing the large cheap-labour force in China, politically made possible by China’s counter-revolution. But the Chinese working class will soon begin to demand more political and economic rights. China is now probably the only large economy where the workers’ wages have grown more rapidly than labour productivity (yes, the Chinese workers’ wages have been rising, and rapidly!). This reflects the growing power of the Chinese working class. At some point, this will precipitate the Chinese capitalist economy into a major crisis, because capitalism needs profit to function and higher wages reduce the profit rate. I don’t see another large geographical area to replace China as the next supplier of massive cheap-labour force. I don’t think India will be able to do it. In any case, the global ecological system cannot afford another “China” with a comparable level of energy consumption and greenhouse gas emissions. In your article One Hundred Million Jobs for the Chinese Workers!, you argue for a transformation in China’s economic model away from its current export orientation towards a focus on domestic consumption. In practice, who would be the social forces supporting this change, and what opposition or structural constraints would they need to overcome? In the article, I basically proposed a left-Keynesian economic policy that would help to alleviate some of the social and environmental costs of China’s current capitalist economic model. Over the past three years or so, China’s political conditions have been dramatically changed. The remaining left-leaning leadership (led by Bo Xilai, the former Party secretary of the Chongqing city) has been purged. The 3rd Plenum of the 18th Party Central Committee decided to “comprehensively deepen economic reform” by privatizing the remaining state owned enterprises in the key economic sectors. Under the current neoliberal leadership, there is no chance for any progressive economic policy to be adopted. However, in the future, when political conditions become appropriate, a democratic socialist government in China may adopt elements of the proposed policy as a transition strategy, which involves a large-scale public investment and employment program financed by taxes on capitalists, to absorb the underemployed labour force and undertake environmental improvement projects. Over the last decade, we have seen a rise in South-South cooperation, culminating in the creation of institutions such as the Bank of the South and the BRICs Bank. Is this a significant phenomenon and does it represent a challenge to the traditional international institutions? This is an interesting development. But for the moment, I do not see that institutions such as the BRICs Bank will significantly affect the basic dynamics of global finance. Although over the long run, it may contribute to the gradual erosion of the dollar hegemony. But I would not consider this to be among the most significant aspects of the current global capitalist contradictions. In The Rise of China and the Demise of the Capitalist World Economy, you argue that global socialism is absolutely imperative to avert the catastrophes that climate change will cause. However, even without the drive for private profit, historic socialisms have also been very ecologically destructive. What factors will ensure that future socialisms are different? The former Soviet Union and some Eastern European socialist states had a miserable record of environmental protection. But this needs to be put in the context that these states remained a part of the capitalist world system and therefore were compelled to pursue capital accumulation in order to match the western capitalist powers in industrial and military capacity. In the Soviet case, it was compelled to prioritise the “heavy industries” or the typical industries that emerged out of the “second industrial revolution” (oil, steel, machinery industries). Given the geopolitical conditions, it was inconceivable for the Soviet Union to specialize in consumer goods exports as Japan, South Korea, and Taiwan did. This has not fundamentally changed in today’s “post-communist” Russia, except that Russia has been de-industrialized. The basic contradiction between capitalism and environment has to do with the incessant drive for capital accumulation, which arises because market competition forces each capitalist and capitalist state to use the surplus value under its control to expand in order to prevail in the competition. Within the capitalist world system, some states that are advantageously placed within the system (such as the “core states”) may enjoy higher environmental “efficiency” than other states. But from the long-term historical perspective, there is no doubt that the modern environmental crisis has emerged during the historical era of global capitalism, and has deteriorated on a global scale as the global capitalist economy grows exponentially. Within capitalism, there is no way to get around this contradiction (though it may be temporarily alleviated or moved around geographically as the core capitalist states relocate their pollution-intensive industries to other geographical areas) as, by definition, there is not a mechanism for the society as a whole to decide how the society’s surplus product should be used, whether it should be used for capital accumulation, public consumption, environmental improvement, or reduction of the general population’s working time. Only with socialist planning can the society as a whole collectively decide to use the surplus product for ecological sustainability. Of course, socialist planning, even under democratic conditions, can still make wrong decisions. But under capitalism or any other market-dominated economic system, the mechanism for the society to collectively decide how to use the surplus product is simply not available. For those who still think it is possible to have capitalism and market economy while achieving ecological sustainability, they need to be reminded that the main virtue of market is supposed to be about competition (and the pursuit of self-interest). If we cannot eliminate competition between individuals, between businesses, and between states, how can we prevent these players from pursuing economic expansion on increasingly larger scales? In Climate Change, Limits to Growth and the Imperative for Socialism, you highlight how the economic collapse suffered by the Russian economy in the 1990s would have to be repeated worldwide more than three times over to stabilize our climate at reasonable levels. Given the drastic fall in living standards experienced during this economic collapse, can an even larger fall in emissions be achieved now without such detrimental human costs? The magnitude of emission reduction depends on the climate stabilization targets. Unfortunately, for all practical purposes, I think it is no longer possible to limit long-term global warming to no more than two degrees Celsius relative to the pre-industrial time. It is still conceivable that the world may achieve climate stabilization with a long-term global warming no more than three degrees Celsius relative to the pre-industrial time. If global warming rises above three degrees, then in addition to the destruction of Amazon rainforest and a global sea level rise by more than 25 meters, we may end up with runaway global warming that destroys the foundation of human civilization. To limit global warming to no more than three degrees (which may not be sufficiently safe to guard against the possibility of runaway global warming), global emissions need to peak before 2040 (with an average annual growth rate of emissions no more than 1 percent between now and 2040) and need to fall by about two-thirds between 2040 and the end of the century (with an average annual decline rate of about 1.5 percent). By comparison, since 2000, the global economy has grown at an average annual rate of about 3.5 percent, the so-called “emission intensity” (the amount of carbon dioxide emissions per unit of GDP) has declined at an average annual rate of about 1 percent, so that the carbon dioxide emissions have grown at an average annual rate of about 2.5 percent (3.5 percent – 1 percent = 2.5 percent). During the historical period 1913-1950 (a period that included two world wars and the Great Depression), the global economy actually achieved an average annual growth rate of near 2 percent. Thus, an average growth rate of 2 percent (over a prolonged period of time) may be the minimum threshold required for global capitalist stability. If the long-term global economic growth rate is lowered to 2 percent and the emission intensity keeps falling by 1 percent-a-year, then we will still end up with an emissions growth rate of 1 percent-a-year. Because of the infrastructure inertia (every year we can only replace a small fraction of the existing capital infrastructure), I think it will be very difficult for the world to push the emission intensity reduction rate above 2 percent-a-year for a prolonged period of time (a 2 percent annual reduction of emission intensity reduction roughly corresponds to a scenario where about a half of the new electric power plants are emissions-free). Suppose, the annual emission intensity reduction rate can be raised to 2 percent, and the economic growth rate is kept at 2 percent, then at best we can achieve zero growth in global carbon dioxide emissions. On the other hand, to achieve a 1.5 percent annual reduction of emissions (not “emission intensity”), global economic growth rate will have to be limited to no more than 0.5 percent. Thus, it is unlikely that a reasonable scenario of climate stabilization (one that is consistent with the long-term sustainability of human civilization) can be made compatible with the global capitalist system. When applying the world systems categories of ‘core’, ‘semi-periphery’, and ‘periphery’, a large number of countries with significant differences and unique histories are grouped together. Do you think the insights produced justify the generalization this entails? In both physical science and social science, any theoretical concept will have to deal with the tension between generalization and individual particularities. The justification of a theoretical concept lies with its capacity to capture the long-term and structural forces that operate through a certain set of individual objects, forces that are not revealed or are disguised when we treat each object individually and separately. The concepts such as “core”, “semi-periphery”, and “periphery” help to illustrate the historical distribution of world surplus value and how the concentration of a large portion of the world surplus value in the core countries has provided one of the necessary conditions required for global capital accumulation. As global capitalism expands, the semi-peripheral countries, and eventually some peripheral countries, have been mobilized to participate in effective capital accumulation. Such mobilization has tended to increase the global labour and environmental costs as a growing proportion of the global population participates in resources-intensive material consumption. It also tends to reduce the share of the world surplus value that was historically available to the core countries. As the structural forces of the core, semi-periphery, and periphery begin to operate differently from how they had operated from the 16th century to the 20th century, we may approach the end of capitalism as a historical system. During your career, you have worked within departments of both economics and political science. Given the many insightful works of political economy that have been produced historically, what is your opinion on the separation of these two disciplines in academia? I enjoyed my teaching and research at the Department of Political Science, York University. However, I have been trained as an economist and am not in a position to describe myself as a political scientist. Modern neoclassical economics (the mainstream economics) considers itself to be the “science” about resources allocation, reconciling unlimited human wants with scarcity. In an ideal free market world, all individuals engage in voluntary exchange that produces the “Pareto Optimum” (the official definition of “efficiency”). By comparison, political science explicitly addresses the question of power, especially the power relations between the state and various social groups and between different states. Both the mainstream economics and political science take the existing capitalist system for granted, as the highest stage of human development. On the other hand, Marxist political economy studies “social relations of production” and the capitalist “social formation” as but one particular stage in the human historical development. It is neither the last nor the most advanced that the human beings can ever accomplish. What is the most important advice you could give to young scholars of economics, politics, and international relations? I don’t know if I can offer the “most important advice”. I would confess that my intellectual world has been organized by “orthodox” Marxism. Methodologically, I follow “dialectical materialism”, which is different from the Anglo-American empiricism in many important ways. “Dialectics” is by no means an obvious word. On the one hand, it is based on the understanding that “the world (the universe) is universally connected”, or every part of the world is in one way or the other connected to every other part. But connection leads to interaction and interaction leads to movement. So another fundamental proposition of dialectical materialism is that the world and every part of it are in permanent movement. In other words, everything (every physical and social system and every component of these systems) always tends to change. Therefore, do not take anything for granted. I mean anything, including “capitalism.” The important task for a serious social thinker is to understand the conditions of social change (to interpret the world), and then to be a part of it (to change the world).